Aging is a fact of life. You can’t fight Father Time. But you can prepare for life as a senior citizen. One way you can prepare your home for a senior lifestyle is with a ceiling track lift. These devices use an overhead track system to transfer people from one place to another. They are a godsend for caregivers or those with limited mobility. But be careful before adding the wrong one to your home. The average cost of a portable powered ceiling lift after installation is about $6,000. There are some factors to consider when making an important purchase like this. Check out our tips for choosing ceiling track lifts that are right for you. There are several different kinds of powered ceiling lifts to consider. First, you have to decide whether or not you want a portable model. Permanent models use a powerful motor and stationary track system. They are ideal for people needing a long-term lifting solution in just one room. The advantage of a portable model is that you can move the ceiling lift from room to room. This is a good option for people who want to make their entire home accessible rather than just one room. One major thing to consider when purchasing your ceiling lift is the weight capacity. Most models come with a weight capacity somewhere between 300 and 450 pounds. Do you need a bigger weight capacity? You can look for a bariatric ceiling lift, which is specifically designed for heavier people. Slings are another important part of the ceiling track lift. You have to carefully select your sling to match your height and weight. You should have your height, waist size, and thigh size available prior to purchase. Are you building a custom accessible home? You need to make sure your ceiling track lift has the right measurements. Ceiling track lifts vary based on their height ranges. You should measure your space in advance to ensure it has the right dimensions. Many models have a wide range of lift. This will allow you to set it at specific intervals. For instance, you can set your model to pick someone up from a bed or the floor. You should double check to make sure your lift meets your safety standards. The lift should have safety constraints like locking latches. It should also have stop controls in case of emergency. You can also familiarize yourself with safe patient lifting tips to prepare for proper handling. You might not expect there to be different types of motors in ceiling track lifts. There are two main types of motors: two-function and four-function. Two-function motors require someone to manually push a patient on the lift. This is a great option for someone with a caregiver. You can purchase a four-function motor if you don’t have daily assistance. These motors are stronger and can move people without the aid of another person. 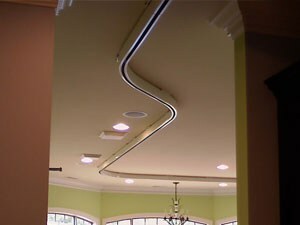 Are you looking to install a ceiling track lift? We can help. We are experts in creating accessible environments. Contact us today for a free consultation.